The Energy Department is preparing for a not-so-far-off future in which all 50 states are generating significant amounts of their energy needs from wind power, from Nebraska right down to our least windy state, Mississippi. The key to making that happen? According to a new report, we're going to have to go bigger. We have the technology, the DOE says. Wind turbines are already at work in 39 U.S. states; they average about 260 feet in height, and about 1,000 of them, according to the American Wind Energy Association, stand taller than 328 feet. But a next generation of much taller turbines -- up to 460 feet tall -- are poised to hit the market. 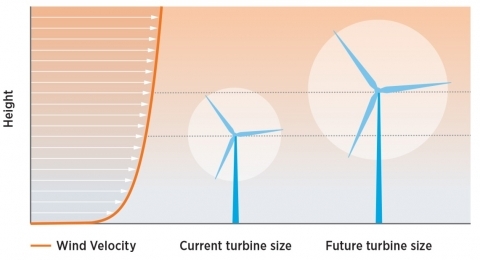 They'll literally be able to reach resources that the shorter turbines cannot: the higher above ground you get, the stronger and more consistent wind becomes. Longer blades, meanwhile, make the generation of electricity more efficient. With that improved capacity, the report claims, an additional 700,000 square miles would be opened up for wind development -- that's more than a fifth of the United States -- bringing the total to 1.8 million square miles. And wind could become part of the energy mix for regions, particularly the Southeast, that have yet to enter the market. Wind power currently provides about 4.5 percent of the nation's total electricity demand; the DOE wants to get that up to 20 percent by 2030, and 35 percent by 2050. Is there a catch? Of course there's a catch. There are the logistical challenges you'd imagine would arise from building mega-turbines -- securing the materials, actually transporting the things - and the DOE's already anticipating the sort of backlash that already plagues moderate-sized wind turbines. But Energy Secretary Ernest Moniz, in a statement, emphasized the benefits: job creation, and a reduction in greenhouse gas emissions of the type that can help the U.S. reach its climate goals.